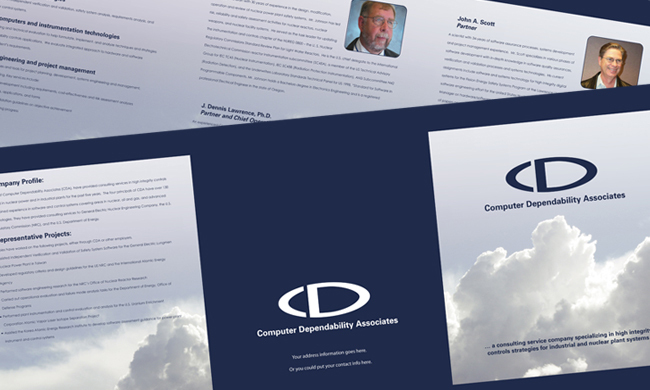 Media Elements designed and built this client brochure and website. This was a very small project and is only being mentioned because we have a very diverse list of clients. The company has since been dissolved. The four partners are all employees or retired employees of the Lawrence Livermore National Laboratory. While working there, partners provided assistance to the US Nuclear Regulatory Commission in a 1997 revision of Chapter 7 of the Standard Review Plan on Instrumentation and Control (I&C). They provided assistance and advice to several foreign governments in adapting US regulations to local regulatory environments. These included the Czech Republic, Ukraine, Russia, Japan and Taiwan. They also participated in several joint research projects with South Korea. CDA is now building on these experiences plus experiences in computer control of Saudi Arabian oil fields to provide digital safety system services to NPP and other industries.